Toronto is experiencing a tech boom. The city was recently named North America’s fastest-growing technology market and the continent’s fourth-largest tech talent market by CBRE’s annual Scoring Tech Talent Report. With an influx of large companies expanding operations in Canada, along with a myriad of local tech companies building their teams, there is a burgeoning demand for talent. In fact, the study noted that a staggering 22,500 tech roles were added to the Toronto job market from 2015-2016. My company, TradeRev, has experienced this boom as well, seeing 40 per cent growth last year alone. And, like many other startups in the city and across the country, getting the right developer talent through the door in order to expand has become a challenge. However, with competition fierce to get the right resources into the right roles, we’ve found success in an approach that puts employees first, while enabling us to innovate at a rapid rate. Here are my tips for how you can do the same. Back in 2009, I merged my love of tech with my background in my family’s car business to create an app that would help connect dealers across the country to vehicle inventory. Seven years later, TradeRev is now changing the auto industry by giving dealers a fast, efficient and accurate way to obtain true market value for trade-ins and used-vehicle inventory. While our mobile and desktop app is intuitive and easy-to-use, there is nothing simple about our backend. We’ve had to evolve our live-bidding auction technology many times over the years, continuously adding new features for our dealer community. For this reason, I’ve found it extremely valuable to have a background in tech and coding and believe other leaders should look to educate themselves on today’s leading tools and platforms. I became an Amazon Web Services (AWS) Certified Solutions Architect-Associate in 2011, and have acquired and maintained another two certifications for AWS, which is the world’s most broadly adopted cloud platform with comprehensive services. I’m also one of 14 who holds AWS certificates in the office, including our CTO. Working with AWS is like working with Lego blocks: if you don’t know what all of the pieces do, you are limited with what you can build. Leaders need to not only hire good technical people, but also take steps to inform themselves on what possibilities the platform unlocks. In addition to the technical certification I earned, AWS also offers a Business Essentials course which is geared to help tech leaders understand the benefits of cloud computing and how a cloud strategy can help you meet your business objectives. 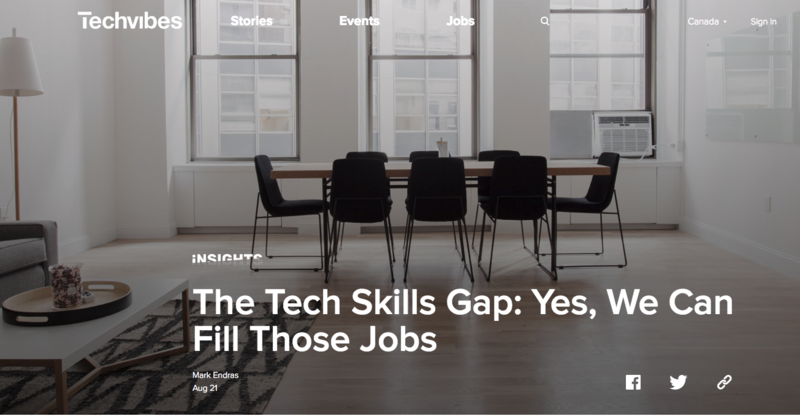 When you consider the history of cloud computing, it’s no surprise we are experiencing a skills gap. While AWS is a behemoth today, it didn’t exist until 11 years ago and only truly hit its stride in the last five years. As a result, many Canadian businesses have yet to embrace the power of cloud computing. A majority of IT departments haven’t touched these new systems and many post-secondary programs just started teaching cloud skills in computer science programs. TradeRev is what is referred to as a “born-in-the-cloud” company. We are all-in with AWS, meaning all our systems run in the cloud and we are constantly pushing the boundaries with what can be achieved, and collaborating with AWS to advance their technology further. As such, we need a team of builders: developers and engineers that understand advancements in cloud technology and can put them to work improving our platform. To address the skills gap, when hiring we look for people who can learn on the job. While competition is fierce to get the right resources into the right roles, we’ve found success in an approach that puts employees first and brings a sense of empowerment. We invest heavily in training and education when an employee joins the team. Sure, it may take a year for a new hire to ramp up on the whole system, but within six months we have them actively contributing to the platform, and assisting teams with projects way before that. Some companies are cautious about putting effort, time and financial investment into training and growing their employees. There is an underlying fear that improving an employee’s skills will make them more marketable in the ecosystem and they’ll seek out new opportunities with new employers. I’m here to tell you that approach is limiting your business. It’s true that the people you train and invest in will eventually leave, but in order to build a productive, engaged and empowered workforce that wants to support your business, it’s a risk you must take. I’m a strong believer that the minute you think you’ve made it and you stop innovating, you die. Innovation today doesn’t just require the ideas people, it takes the doers—the people who are looking at all the building blocks available and making new tools for customers. These are the tech workers that companies in major hubs, such as Toronto and Vancouver, are looking for. If you’re thinking that you need to shake up your operations or try a new approach to innovation, don’t wait. Invest in learning for yourself now, and look at how you can get your team learning alongside you. One of the biggest enemies in today’s business landscape is time. We don’t lack great ideas, but we do sometimes fight for resources and run up against the clock. That’s why the best way to fight back against the skills gap is by tackling it head on. Leaders need to learn new skills and technologies, and make sure the people we employ have the opportunity to tool up too. In the same way that having the right team, expertise and strategy in place are crucial for driving any business forward, identifying the right industry allies is essential. We seek out organizations who not only share our values and vision but who also look to us as collaborators. That’s why our relationships with organizations like AWS have been so successful—knowing they have our back and will jump in at any time to support but that they’re also willing to grow and evolve with us means we can realize our common vision together. While the tech shortage is certainly a challenge, it shouldn’t hold any business back. By taking the right steps, you can ensure your team is equipped with the right skills and knowledge to drive your business forward.